Tuesday 10.25am: A man has been seriously injured in a crash on Whittlesey Road, Peterborough in the early hours of this morning (23 December). The crash happened at about 3.30am at the junction of Whittlesey Road and Fletton High Street, and saw a red Renault Megane roll onto its roof. 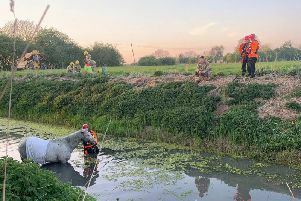 There was one man in the car, and a spokesman for Cambridgeshire police said he was seriously injured. Firefighters used specialist cutting equipment to release one casualty. A spokesman for the East of England of England Ambulance Service said the man in the car was conscious and breathing when they arrived at the scene, and it is not thought his condition was life-threatening.